Can the stylish racer hit top gear? For the most part, driving games have fallen into two broad camps: simulators and arcade-style racers. But Microsoft’s flagship racing franchise, Forza Motorsport, has always sought to appeal to gamers on both sides of that divide. 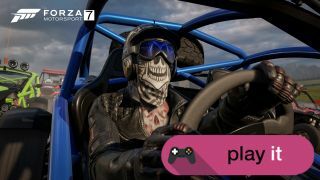 That’s particularly true of Forza Motorsport 7, which boasts many of the world’s finest circuits and plenty of proper racing machinery: in it, you can participate in Nascar and Formula E races, or mess around on the Top Gear test track. Forza 7 certainly craves credibility among those who take motorsports seriously. But, equally, it’s also a big-budget game that needs to sell well and so must be accessible to all. Forza Motorsport 7, accordingly, doesn’t skimp on the hand-holding. After a brief intro in which you participate in three one-lap events, it propels you into the Forza Driver’s Cup – the game’s career mode – with a veritable arsenal of driver aids switched on. Those include steering and brake assistance, stability control, ABS and driving line indicator. Damage is set to cosmetic-only as standard, which has a considerable impact on the gameplay. And in true arcade style, you can hit a rewind button to erase your more egregious driving errors. The breadth of the car selection is impressive, but certain classes are much more fun to drive. The Forza Driver’s Cup is certainly a meaty affair: it’s split into six tiers, each of which lets you choose between a variety of racing series. Completing races earns you Series Points, of which you must amass a set amount to move up a tier. Forza Motorsport 7 has two other levelling up systems: a general driving level one -- which rewards you at each level-up with a choice of a car, in-game credits or a new racing suit -- and a car collection one. If driving, rather than collecting stuff, is your priority then the tiered car-collection system can annoy. Pretty soon you'll start encountering racing formulae that you can’t participate in, because the cars it features are in a higher tier and are therefore locked. Collecting is very much to the fore in Forza Motorsport 7: the game has a system called Mods, three of which can be equipped before each race. Mods are essentially extra challenges – such as driving in the rain or at night, or finishing first, or pulling off a set number of overtakes rated ‘Good’ or ‘Perfect’ by the game. Mods are delivered in the form of trading cards, via loot-crates which you buy with in-game credits. You can also buy loot-crates which include cars and ephemera, such as racing-suit designs. If desired, you can give yourself extra challenges such as racing at night or in the rain. The Mods system is pretty welcome, since it makes the game more of a challenge which, frankly, it isn’t at first. At their default setting, your AI-controlled rivals drive like grannies in a supermarket car-park, and it wasn’t long before the game suggested that we crank it up to above-average proficiency (which, at least, it gives you an XP boost for). Even in the fourth tier of the Forza Driver’s Cup, we kept it cranked up and still managed to win races. Like any driving game, Forza Motorsport 7 lets you select a variety of driving views. But unlike its peers, even that ubiquitous system throws up a bizarre anomaly. Selecting the arcade-style behind-the-car view somehow wrecks the cars’ handling, rendering any machinery built before 1980 pretty much undriveable, with zero grip and unpredictably wild oversteer. Avoid it like the plague. Even in cockpit view (pretty much the only viable option, since there is no roof-view), the car-handling – surely a fundamental pillar of a driving game – struggles to impress. Some cars are great to drive, such as modern GT racers, brutish Nascar beasts and nippy Japanese sportscars like the Honda S2000 and Mazda MX-5. But others – particularly 70s muscle cars, short-wheelbase ATVs and vintage Formula One cars – handle much more waywardly than they surely would in real life. We were excited to find Formula E cars in the game, but after experiencing the lack of grip and sudden snap-oversteer the game endows them with we stopped racing them at the earliest possible moment. There’s no way that Formula E cars are that evil-handling in real life, and the fact that Forza Motorsport 7 won’t let you sell any cars on which you have expended hard-earned credits makes matters worse. Even the cars which seem to have had the most attention lavished on their handling models offer a tiny fraction of the feel and feedback routinely provided by the machinery in the likes of Project Cars 2. Although Forza Motorsport 7 has a decent climate engine – tracks, for example, become noticeably more slippery as wet races progress – all the tracks seem to have exactly the same level of grip, which is very much on the low side. You simply don’t feel so connected to the cars as you do in rival games. And the game’s underlying arcade-style nature betrays itself badly in the actual racing. Essentially, if you don’t perform manoeuvres which would get you banned for life in real-life races (and would cause dangerous pile-ups), you won’t get very far in Forza Motorsport 7. First-corner crashes are routine (which is also the case online), and braking by driving into the side of other cars is a thoroughly legitimate tactic. The game also encourages you to counter understeer in low-radius fast corners by applying the brake with the throttle held down full, which would lead to disaster in real life. Getting your braking done before entering a corner is anathema to Forza Motorsport 7. Pre-launch, the online side of Forza Motorsport 7 worked smoothly and seamlessly, as you would expect from a Microsoft game, and the absence of rewinds rendered the racing more of a challenge. But it was still determinedly arcade-style and once the lottery of the first-corner traffic-jam – an impressive 24 cars can race at a time – had been negotiated, overtaking tended to depend on others making mistakes. The lobbying system seemed quick and efficient, and setting up private races was simple enough. If you’re worried about buying new cars you might only race once online, you can hire cars instead, but you won’t earn any XP in a hired car. Track-wise, it’s hard to fault Forza Motorsport 7. There is a bias towards North American tracks, with the likes of Laguna Seca, Watkins Glen and Long Beach augmented by various classic ovals. But you also get iconic international tracks, like Brands Hatch, Silverstone, Monza, the Nurburgring and Bathurst, plus some very enjoyable long road-circuits – one set in Prague is particularly fine. But even on classic tracks, you sometimes feel the game’s arcade-style nature dumbs things down. For example, in the game, Nascar-racing around ovals was completely devoid of the elements which make it interesting, notably drafting, tyre-degradation and responding to information from spotters. If you’re seeking an arcade-style racing game which looks and sounds fabulous (the music soundtrack is pretty decent, and the cars make some magnificent noises), Forza Motorsport 7 should prove pretty enjoyable and satisfying, particularly if you wouldn’t class yourself as someone with Lewis Hamilton levels of driving skill. But don’t be deceived by the presence of classic tracks and ultra-desirable machinery: Forza Motorsport 7 is an arcade-style romp rather than any credible facsimile of real-life motorsport.